No holiday table would be complete without a selection of mouth-watering side dishes to complement the main event, be it turkey or ham. But that doesn’t mean holiday side dishes play second fiddle! Each one is a chance to display creativity and make use of the season’s best produce. Cooking up delectable veggie-packed accompaniments is also the opportunity to offer vegetarian guests more options come mealtime. 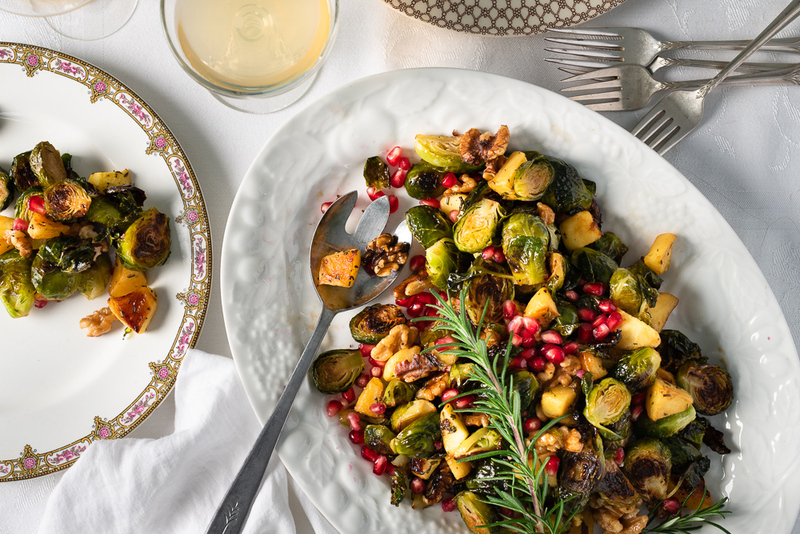 SugarBee® apples take center-stage in this twist on classic roasted Brussel sprouts. Use fresh chestnuts if you can get find them, otherwise walnuts are a wonderful substitute. Check the notes section for instructions on how to roast fresh chestnuts. It’s very simple! Preheat oven to 425°F / 215°C. 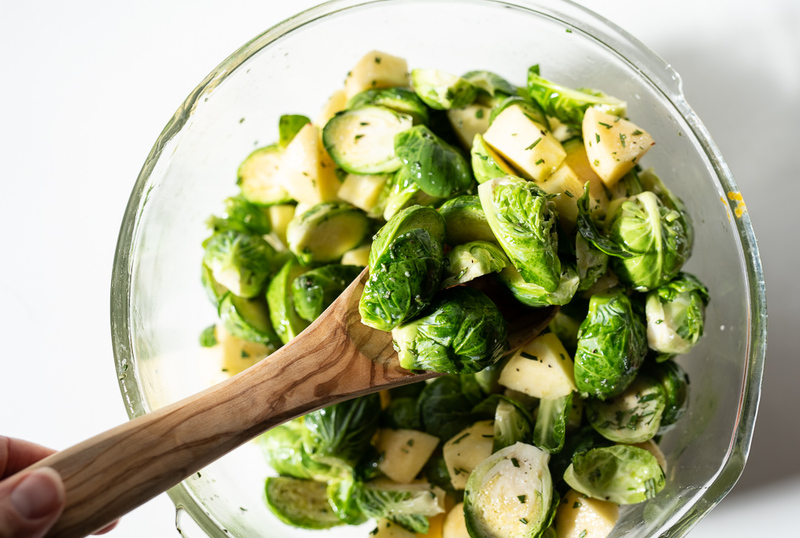 Remove any damaged leaves off the Brussel sprouts. Cut the hard bottoms off, then slice each sprout in half. Place in a large bowl along with any undamaged leaves that fell off during cutting. Add the SugarBee® apples, olive oil, rosemary, salt and pepper, and toss thoroughly. Pour onto a large baking sheet and shake gently to evenly distribute. Turn over Brussel sprouts so they are cut-side down. Roast in the oven for 20 minutes. Add the chestnuts (or walnuts, if using), mix well and drizzle with the maple syrup. Roast for an additional 5 minutes. Remove from oven and put back in the large bowl. Garnish with pomegranate seeds or cranberries. Taste and adjust seasoning if required. To roast fresh chestnuts, preheat an oven to 425°F / 215°C. Use a sharp paring knife to make an x-shaped cut on the round side of each chestnut. This will release the internal pressure while they’re cooking to ensure they don’t explode. Put chestnuts on a baking sheet, x-side up, and roast in the oven for 15-20 minutes, until the skin around the cuts pulls back and the inside of the chestnuts has softened. Remove from the oven, wrap them in a tea towel, and squeeze them hard. You should hear them crackling. Let them cool a couple of minutes, until cool enough to handle, then peel.